I attended and spoke at SQL Saturday #273 on February 22, 2014. My presentation "SQL Server Security Easy Button" went off without a hitch. My presentation files can be found here. This was the first time the event was held at the University of South Florida's College of Business Building on the main campus in Tampa, FL. It was an excellent facility for a SQL Saturday. No crowding, no bottlenecks, great classrooms. The atrium in this building provided the perfect place for vendors to setup and for people to network. As usual, an excellent lunch was provided by Latam's. A college campus is the perfect venue for a SQL Saturday. They have well-equipped classrooms and it gives students a chance to interact with people who are working the real jobs for which they are studying. "Eternal story on temporal objects" by Dmitri Korotkevitch. 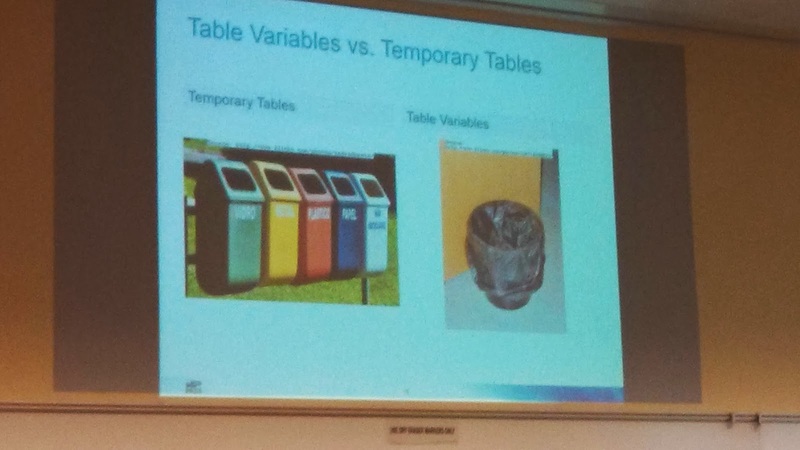 Dmitri reviewed all the possible temporal objects that SQL Server used and demonstrated the best way to use them. Afterwards, Dmitri told me that his Twitter account gained 25 followers after myself and Grant Fritchey tweeted during his session. He said, he now has more followers than tweets! I told him that he had to be capable of one epic tweet per day. The pictures he used to illustrate tempdb amusingly demonstrated his talking points. 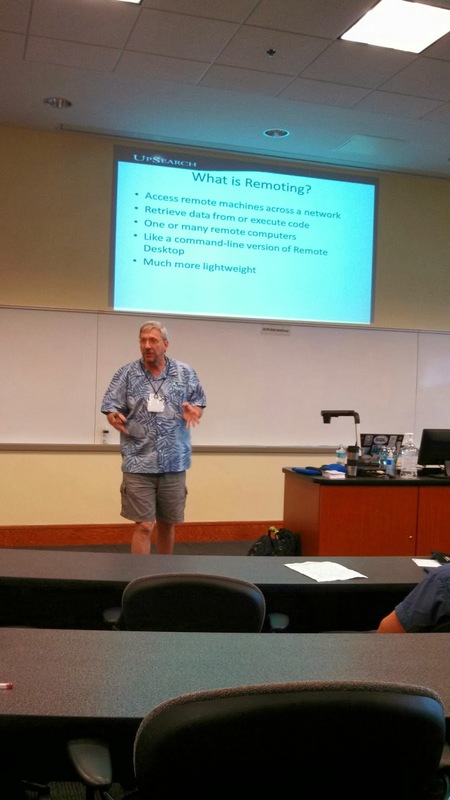 Allen White's "Managing SQL Server Efficiently with PowerShell Remoting". Allen did an excellent job demonstrating how remoting makes it much easier to manage multiple machines and describing the maturation of PowerShell. It's much easier to build and configure a new database instance on Windows Server 2012 with the V4 cmdlets. Chris Skorlinkski's "Your Best Interview Ever". I was familiar with most of the material that Chris covered. The main concept I took away from this session was to have an "elevator speech" ready to describe yourself to potential employers. I loved the example he used for it. It accomplishes all the goals of an elevator speech. Identify yourself, describe what you can do, and what your objective is. Thank you to Pam Shaw, Leigh Freijo, sponsors, speakers, and volunteers for putting on a great event! I especially appreciated that the volunteers printed and cut up the SpeedPass for the speakers! Also, thank you to Brian Mitchell and Jonathan Keyahias for answering some questions I had related to projects I have in progress at work. Finally, the best juggler at SQL Saturday #273 was Eric Wisdahl. 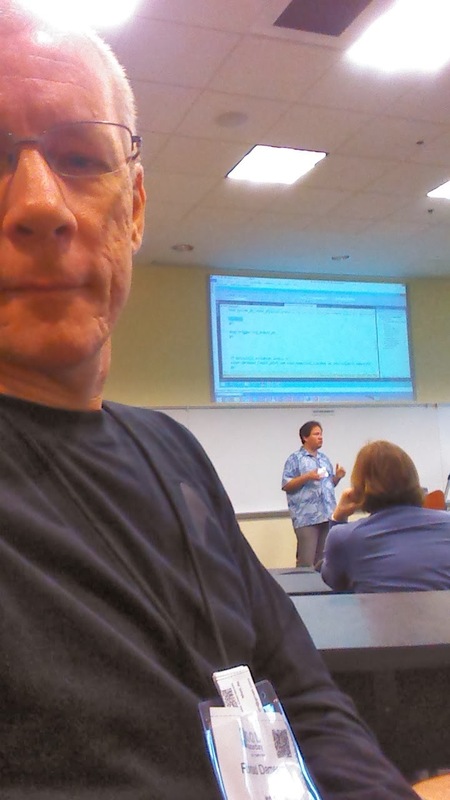 SQL Saturday #273 Tampa - I'm speaking!